A Christmas tree without a tree topper will always feel bare. Thankfully, there are plenty of tree toppers to choose from to remedy this situation. In fact, the options are too many that it can be really confusing to choose. To make the task a lot easier and manageable, this article compiles some of the unique tree toppers available today. First up is a tree topper that's an exciting choice for shoppers that are looking for something eye-popping and exciting. 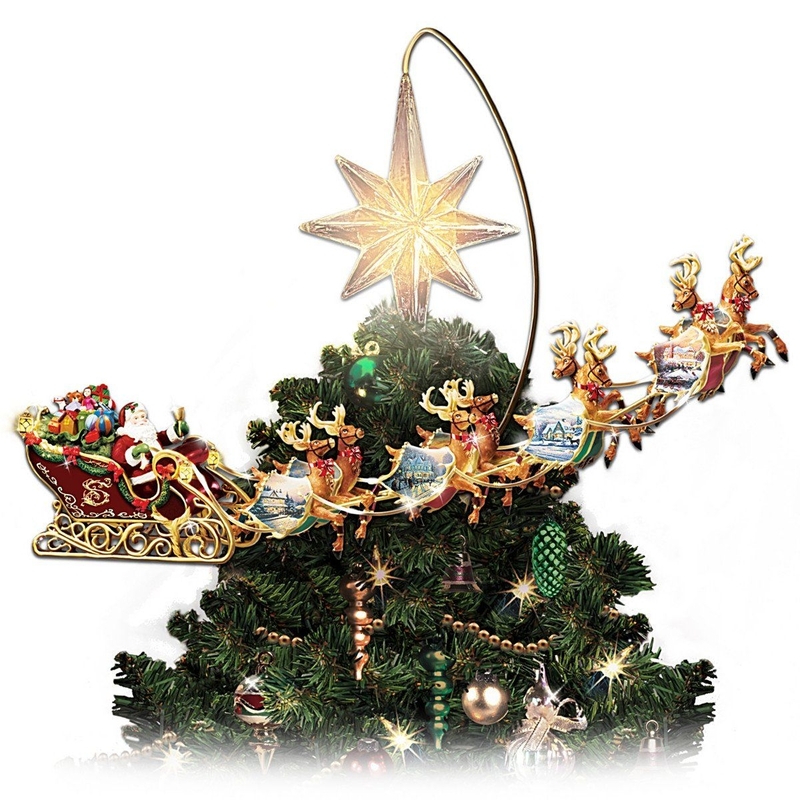 This tree topper comes with a huge star, a Santa sleigh, and a golden spring connecting the two. The setup is already attractive by itself, but that's just the half of it. When you switch "on" this tree topper, the star then starts to illuminate brightly. Then, Santa and his reindeers begin to slowly rotate around the star. It's not only entertaining to watch, but it's also mesmerizing. This item is an excellent option if you or your kids are fond of Mickey Mouse. The topper features a "North Pole" ornament in white color and sprinkled with snowflake and Mickey Mouse logo in gold color. Another highlight of the piece is Mickey Mouse riding on a sleigh, encircling the "North Pole." Of course, Plutos is there, and he's even leading the reindeer pack. The item also includes lights and sounds. It will need an electrical outlet for it to operate correctly. This is a tree topper that perfectly combines the joy of the sea-faring lifestyle with the holiday season. The highlight of the product is the HMS Victory ship. The model is complete with the iconic design and the gorgeous sails. The topper's primary material is wood. Thus, it's more luxurious compared to fabric types. On top of that, the product is meticulously handcrafted by master artisans. This Christmas topper is also an excellent choice if the interior design is nautical inspired. This tree topper is an excellent choice if you want to have a very flashy ornament. The product features a 3-dimensional star that looks great no matter the viewing angle. However, the highlight of the piece is the Swarovski crystals that line the edges of the star. The ornament excels at "glittering," and the design is mesmerizing. The product stands at eleven inches and a half inches, and five inches in width. It comes with a spring at the bottom so you can just twist the ornament into place. An excellent tree topper if you want something that can easily steal the show. First of all, this tree topper is large with a height of twenty-two inches from the bottom of the face to the tip of the hat. At the widest point of the face, the width is fourteen and a half inches. The highlight of the product is the cheerful snowman giving the Christmas tree a festive hug. It also comes with a scarf to complete the decor. Keep in mind that there's a wire underneath the arms that allows you to manipulate the position. This unique tree topper is one of the best choices you have if you have a farm-inspired, industrial or rustic interior design. Everything about it fits nicely with the said interior setting. The tree topper is a snowman with a sort of faded wash color. It comes with a tall hat and a long pointy brown nose. The snowman also comes with a fixed long arm. It will appear as if it's hugging the Christmas tree once in place. The product is a combination of wood, metal, and fabric. A tree topper that is sure to "brighten" up the place. The item features a large 5-pointed star. The highlight of the product is the LED bulb that's inside the item. The LED light produces a very noticeable glow. With the help of the striations incorporated into the star's design, it will appear as if it's twinkling once it changes color. The bulbs are powered through an electric outlet via an adapter. Also, the wire is colored green so it will blend in with the Christmas tree. Why not combine the "Luck of the Irish" and the Holidays with this uniquely styled tree topper. This item features a Santa Clause in green robes, bringing that Irish Luck into your home. Additionally, Santa Clause is holding a pot of gold to emphasize the essence of good fortune further. Of course, the Irish Luck theme won't be complete without the iconic shamrock, which is incorporated into Santa's robe. If you think Mrs. Claus deserves some love and attention during the holidays, then this is the tree topper for you. With this item, Mrs. Claus is carrying a basket of sweet treats for everyone while holding a pastry bag on the other hand. The item comes with a cone that allows for easy attachment to the top of the Christmas tree. However, you can detach the cone, and the product can work well as a free-standing decor. A tree topper that is perfect for the feline lovers. The item features a cat cheerfully reaching a star. With its polished and shiny finish, it's sure to catch the attention of the onlookers. The product is made from aluminum. Also, each item is handcrafted from a single artist, and that means every product is slightly different. The great thing about this product is it can be used as a decor all year round. Once the holiday is over, you can just move it to a table or any flat surface.